Noir has always told the story of people who decide to cross an invisible but palpable moral line. The color black in french. Noir was created by first generation Canadians who wanted to create a diverse space where people from different ethnicities can come and feel confident that their beauty needs would be taken care of. Having over 10 years experience in the beauty industry Noir founders noticed a lack of diversity in the salon services generally offered. Toronto is in need of a salon that caters to everyone and truly represents the city's multiculturalism. A salon that offers services for the wide variety of hair textures, kinks, curls, long short and in between, as well as offering colours and cuts under one roof. A professional, caring, and time efficient salon in the downtown core that takes your needs and wants seriously. We are a full service hair salon and makeup studio. We commit to have you looking your best. 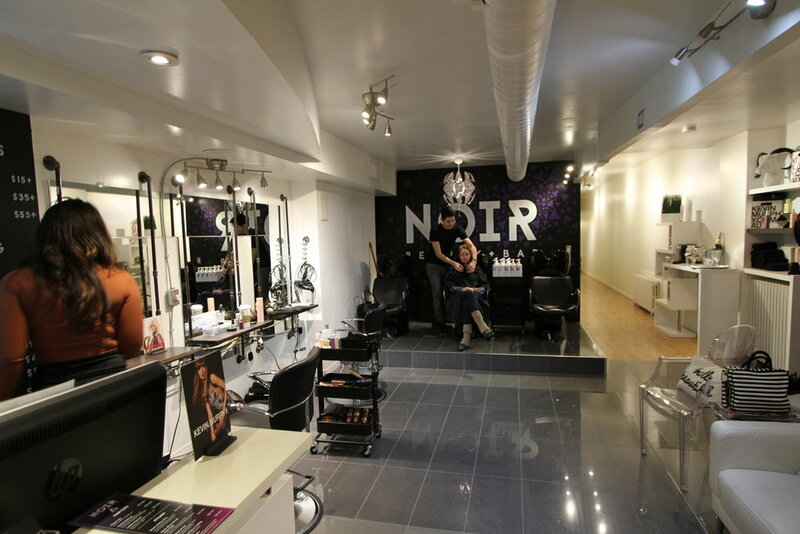 No matter the occasion Noir Beauty bar is a place where beauty and relaxation come together. Our mission is to provide the best services to each and every guest. Let your hair become our art. Our knowledgeable stylist specialize in all of the latest techniques in haircutting and colouring, with the help of high quality products such as Kevin Murphy and Deva Curl your hair will thank you. Whether you want to be prepped and pampered before a night on the town or treat yourself to a lunch hour blowout, Noir will have you shining in the day and glowing in the dark! Noir is night where we come out to play, to let loose, and free ourselves from our daily routine. Noir is the canvas we use to make you beautiful. Noir is more than a salon. It's a multi-purpose space for women to be celebrated and empowered. At Noir we want to create a powerhouse for creatives, dream seekers, goal-getters and entrepreneurs. A space to host networking events, entrepreneur classes and branding parties.